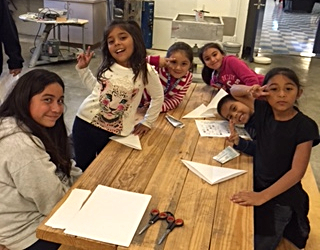 The Boys and Girls are Back! 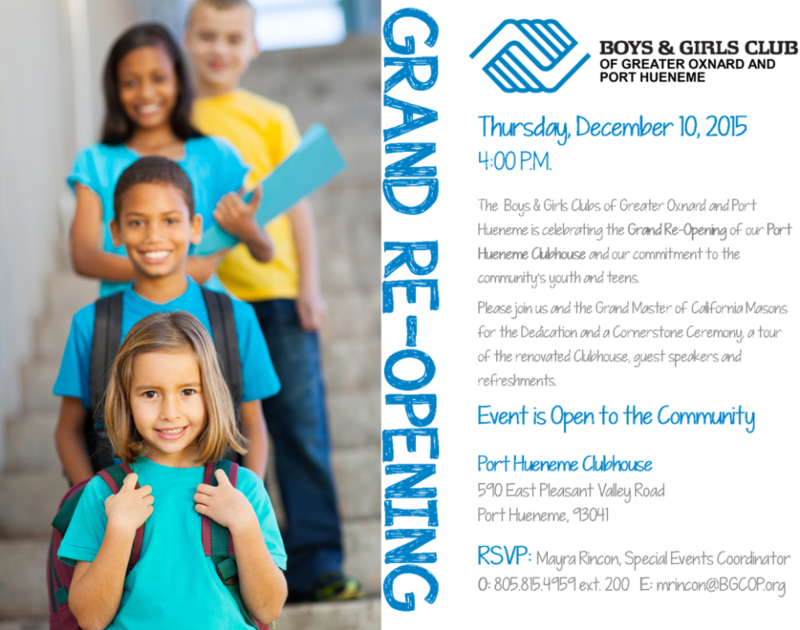 After a long closure, the newly renovated Port Hueneme Clubhouse of the Boys and Girls Club will have its official re-opening on December 10. 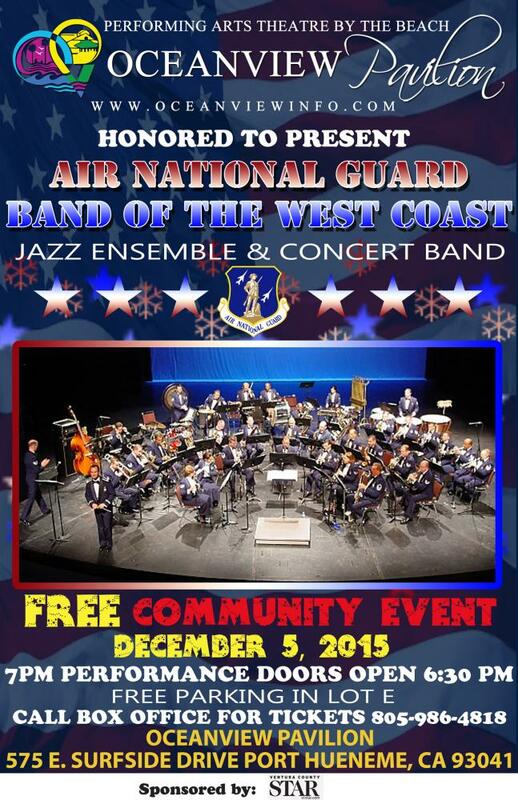 The Air National Guard Band of the West Coast 2015 Holiday concert tour will present a free concert in Oceanview Pavilion’s Performing Arts Theatre by the Beach located at 575 E. Surfside Drive Port Hueneme with FREE parking in Lot E.
Under the direction of Commander and Conductor Captain Vu Nguyen we are pleased to announce the show will feature the one and only “Patriots in Blue” Jazz ensemble as well as the 30-member Concert band. The show will feature military and songs of the season to help concert goers anticipate the joys of this wonderful time of the year. Be prepared to clap, cheer and be thoroughly entertained from the opening chords to the echoes of the last note. You’ll be glad you came and will want to hear them again. A great way to kick off the holidays this is truly a concert for all ages! A maximum of four tickets per household. For tickets and additional information call the Oceanview Pavilion box office at (805) 986-4818. 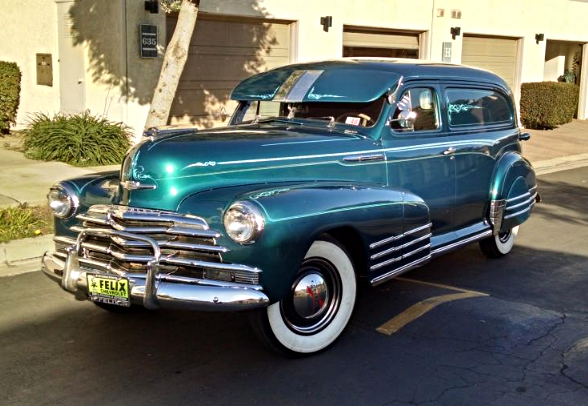 Did you know Port Hueneme boasts 11 Ventura County Historical Landmarks. Among them are the Moranda House (1890), the Hueneme Women’s Improvement Club (1909), the Richard Bard House (1910) and the Hueneme Bank Building (1925). The architect of the white neoclassical edifice at 220 N. Market Street that presently houses the museum was Myron Hunt, who is also credited with designing the Bard Mansion, the Mount Wilson Observatory, and the early building at Occidental College. The approximately 1600 sq. fit structure, tiny by today’s bank buildings, would not be constructed until 1925. Back in 1889, however, when fewer than 9,000 souls resided in Ventura County, Hueneme was widely known for its four muddy streets and row of clapboard storefronts. Achille Levy was given the responsibility for erecting a brick building (the first in town) to serve as the Bank of Hueneme. The cement sidewalks surrounding the building were also a first. 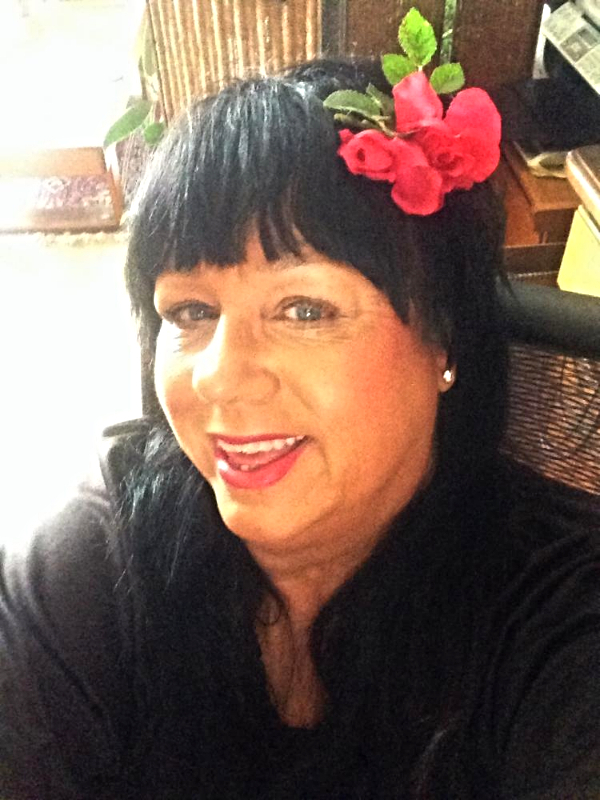 Hueneme was just starting to boom and Levy played an indispensible role in financing the houses, businesses, and farms springing up at the time. Levy’s banking endeavors started in 1885 when Charles J. Daily, then the 20-year-old manager of the sprawling Patterson Ranch entrusted his life savings ($480) to Levy. Many more business clients, including most of the farming families whose names grace many of our Ventura County streets and roads would start banking with Levy. Levy’s private bank wasn’t held to the rigid banking practices prescribed by law today, so this astute student of human nature issued loans not necessarily backed up by collateral but rather by the high moral character of the customer. Levy’s “character loans,” interestingly enough, rarely resulted in default. The City of Port Hueneme and the Hueneme Chamber of Commerce are continuing the annual tree-lighting tradition on Dec. 3, 5:30 PM at City Hall (250 N. Ventura Road). There will be free pictures with Santa (line begins forming at 5 PM), food trucks, kids activities including a petting zoo sponsored by the Port Hueneme Police Officers Association, and entertainment. Remember to bring your own chairs or there is lawn seating available. For more information contact the Chamber at 488-2023. Ben Carson is not an idiot. He’s not stupid. He’s not even a fool. He’s wrong, sometimes as wrong as you can be, and he is incredibly unqualified to be President, but he is not an idiot. He can’t be. He was a neurosurgeon, though that barely explains it. Because Ben Carson was a neurosurgeon like John Coltrane was a saxophone player or Jimi Hendrix a guitar player. Like Wayne Gretzky was a hockey player or Rembrandt a painter. 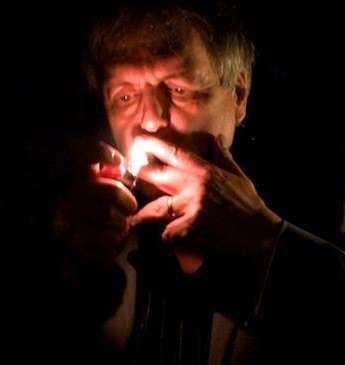 He was one of those guys who was so brilliant at what he did it does not even seem real. In fact in all likelihood he was much better by several degrees of magnitude at what he did than anything you will ever be able to do no matter how hard you try. He was one of the greatest surgeons in the entire history of medicine. A thousand years from now they will speak of Dr. Ben Carson’s surgical feats with awe. So he’s not stupid. Best not to pretend he is. And he is definitely an egomaniac. But when you are that good you are allowed to be an egomaniac. In fact you are allowed to be anything, anything except president. Because he’d be an awful president. But not even that detracts from his brilliance. The point of all this being that when we criticize Ben Carson by calling him stupid, all we’re doing is looking stupid ourselves. Let’s not fall into that trap. Like the trap Ben Carson has fallen into thinking that a genius is a genius at everything. They aren’t. A genius can be just as dumb as anyone else at something they’re not good at. Power lines between Ventura and Santa Barbara vulnerable to failure. Wilh. Williamson (WWH) hit hard by anti-trust probe. An animated comedic look at transportation history.